That's how I feel. Just because something isn't "real" doesn't mean you can't be emotionally invested in it. How many people believe Star Trek is real? Star Wars? Are you sure there is no "force" and it can't be with us? When you grow up with something, it becomes part of you. 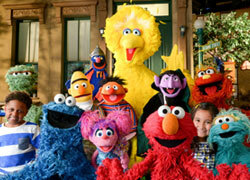 I grew up with Muppets from the time I was able to sit in front of the TV and watch Sesame Street. It's also the same with fanfiction. We all know we aren't writing cannon stories but does that make it any less real? If I write a story and I get emotionally involved in it and the responses to it does that make me living not in reality? Perception is an individual thing. I would not go around telling anyone what they can and can not believe in. If the studios didn't expect people to have a reaction they wouldn't have tried this. They knew that people would take the "split" as real. That's why they did it. Preach it! I could never say that any better! Kermit & Piggy always had a contentious (and downright one-sided) relationship on the Muppet Show. It doesn't matter if you don't like this "stunt" because this simple story has helped create more buzz than the entire marketing campaign for Muppets Most Wanted. No one is going to avoid the show because of this. In fact, it might get more people to tune in. This comes directly out of Jim Henson's playbook. It was the plan to break the frog and pig up and have it play out all over the media until they reunited. TV shows are at their best when the two lead characters have this sort of friction. This is no different. I'm confused by this conversation. To people wondering whether this is "just for the show" or "just a publicity stunt," what other options are there? If we all know that these puppets aren't dating when nobody has a hand inside them, then what would be the situation if this were not just a publicity "stunt" for the show? I can't even call it a stunt. It's publicity. A publicity stunt is when you create an appearance of a false situation for the sake of publicity, all with the intent of undoing the false perception eventually. Since the entirety of Muppet life is fiction, there is no "false." Yes, they will definitely put them back together, but it's part of the plot of the show, so it's publicity but not a stunt. I do understand why we're talking about it. I understand the emotional investment in these or other fictional characters. And I think it's worth having fans debate whether this is the right move, or whether/when it will be resolved. I even understand people getting upset by this move. I just don't understand the debate over whether or not this is just for the show/for publicity. As far as I can tell there is no other possibility. While I appreciate what came out of it, I still can't wrap my mind about Disney's decision to put the characters on QVC. They aren't some aging actress from the 70's selling costume jewelry to aging housewives who haven't heard of every internet merchandise outlet ever. While the entire MMW marketing campaign took some time to seep in, the months of nothing with an all at once onslaught probably turned off people instead of excited them. And frankly, QVC seemed...desperate. Not that there weren't some fun moments, but really?! QVC?! I really think the collective fanbase was too cued up for the movie (myself included) to realize how lame that promotion was (even if Link was in it). This isn't one of those times. They created something to talk about and it's getting talked about. It doubles as a plot point reveal, as it's very important to the show's story that they're no longer a couple. I'm sure without this, the most casual fans would be confused as to why they're not together in the series proper. Either way, I agree the relationship was never that stable. Maybe that brief period in the 80's. They've been on again, off again, on again the past 20 something years... it goes to show how overly invested in the characters some are. I don't think that's the conversation at all, so much as everyone knows this is marketing. The thing is, it's change. Change we've had for years, but this breaks up treasured headcanons that were somehow stubbornly held up even though the characters have been on again off again. Duke Remington and jvcarroll like this. I still don't get how fans forget how much Kermit denied his relationship with Piggy during the Muppet Show. It was always volatile and it was never quite clear how close they were. The movies and specials are a different matter. The one thing I haven't liked about the last two films was how much they focused on the frog and pig dynamic. Having their marriage and life together be a central theme just seemed cloying and dull. If that's the central thing that excites a fan about the Muppets then I just don't know what to say. Eugh. It's only supposed to be one element. As for the marketing campaign for MMW, I don't think any of it was a misstep. I have absolutely nothing but praise for all of it. The thing I find strange is that this simple breakup has received more press than all of the brilliant ideas Disney marketing executives dreamed up for their last film. So as a fan from the very beginning of TMS all the way through now, I support this campaign completely. My only real complaint about MMW was the too much too soon, instead of a steadier trickle. I never understood the slowness and overcautiousness of Disney's handling in between movies. Other than that, at least they tried. Though, still... QVC was a real "What were they thinking" moment to me, even if it was after the fact. The message sent there is "Gee, are they desperate or what?" This message is "this is going to play out nicely for the show." I still don't get how fans forget how much Kermit denied his relationship with Piggy during the Muppet Show. It was always volatile and it was never quite clear how close they were. The movies and specials are a different matter. The one thing I haven't liked about the last two films was how much they focused on the frog and pig dynamic. Having their marriage and life together be a central theme just seemed cloying and dull. If that's the central thing that excites a fan about the Muppets then I just don't know what to say. Eugh. Honestly? Yes. I love the Pig, I love the Frog, but I've always been a bigger fan of the wackier characters. Kermit and Piggy are the iconic Mickey and minnie of the franchise, I've always been drawn to Donald, Goofy, and essentially everyone but Mickey and Minnie (but still enjoy them). 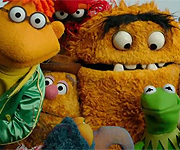 As far as the show is concerned, I'm more interested in how the band, Bunsen and Beaker, Scooter, and yes even Fozzie and Gonzo plays out in this show. The Kermit Piggy relationship will play out quite good in the show, no doubt... but I'm more interested in the Fozzie Human Woman relationship. It's not the conversation you're having. You have been engaged in thoughtful conversation about the direction of this campaign, the show, and Muppet marketing in general. Several others have also been discussing these things. It's not really even a full conversation. The conversations here are good. I won't call out the specific individuals, but every few posts there is another "I think this is just for the show," or "I hope this is just a publicity stunt." I'm completely thrown by those. I get something like "I hope they're back together soon," or "I hope this doesn't continue for future productions," I'm just at a complete loss on the other comments. I value the opinions of these people, I just truly don't know what they're getting at. I guess it's just distracting. I'm also a bigger fan of non-Piggy-Kermit-relationship stuff. The extent to which the focus is on the romantic relationship between them, especially in a sense that is sometimes regarded as "serious," "grown-up," or "mature," tends to mirror the extent to which the silly Muppet-y stuff gets diminished. I don't expect them to be kiddy stuff, but I expect a level of immaturity. A squabbling ex-couple opens doors for all kinds of immaturity. Already addressed this, it's a bit more complicated than headcanon, lol. I'm more interested in what happened to Camilla and why Gonzo is online dating. He can get chickens whenever he wants! I feel that there is too much personal ownership over things like this. I can find changes to certain things (ones I listed before) to be obnoxious, disrespectful of the original concept, or destructive to some extent, in the context that it's the fault of the writers, not the characters themselves. And usually if something's bad enough, it's something to just ignore. Like when they had that Simpsons plotline about Skinner not being Skinner, and it's just completely ignored except for one callback. Though, that show's continuity is wildly inconsistent, and they tend to make the mistake of calling back to things instead of ignoring them. With the Muppet characters, I've noticed that Disney tends to have a virtual celebrity handle on the Muppets. If anyone remembers the TV Guide "Top 5 non-human characters" Piggy and Kermit have no mention of being puppets or Jim Henson, yet ALF's entry on the list has nothing but references to him being a Puppet. I think that's the intent of publicity here. That we know they're fictional characters, but very special fictional characters that sort of exist sort of don't. The whole "celebrities in their own right" thing that you just can't have with Spongebob or Mickey, or any cartoon for that matter. Part of the fun is the illusion and suspension of disbelief while knowing these are puppet characters. That's why so many of us are Muppet fans. The talent to make these things seem real while knowing it isn't. That's what I like about this "announcement." Taking it too seriously, however, drains all the fun out of it. That's what I really liked seeing int The Muppets. That one line Kermit says about how Piggy does and says things that pushes Kermit away. That was a refreshing level of complex maturity in a sea of "Fat Joke/ HI-YAH!!!" that plagued the characters since the 90's. I've said it a hundred times before, but it's jarring that Kermit and Piggy seem so distant in MFS. It's due of course to bad writing and direction, but it comes off...weird. The movies usually give Kermit and Piggy a softer, more gentle relationship because that's how movies work in comparison to TV shows. So I can see where some are turned off by this announcement. But those repetitive "Pig Joke/HI YAAAAH!!!" TV appearances weren't exactly fan favorites. And they were clearly goading Steve in that direction, even before the Disney sale...especially before that. Remember that Thanksgiving Parade appearance to announce VMX? As long as we never get that sort of thing again out of the two characters, I don't mind the direction. Which I can't say I'm a fan of at all, lol. Jim Henson (and what's more, Walt Disney) did a great service by sharing the behind the scenes wonders with young audiences. That is often a big reason why kids get motivated to want to do these things when they grow up. For many fans, that is the fun. Duke Remington and CensoredAlso like this. This could very well be a publicity stunt for the new series. And I totally agree with you cjd.Miss Piggy was the one forcing her romantic love on Kermit all these years.She could never get it in her head that the feeling is not mutual.It doesn't surprise me a bit to hear of their break up.To me it's the same old story.According to Kermit,they were never married in the first place. I get a kick out of how while kissing Topher Grace,Miss Piggy would look at Kermit every few minutes,to see if she's making him jealous.Then later on,she literally pushes Denise out of sight. Yeah. That's sort of what I was thinking. The relationship was never really mutual from the get go. and were actually not established as an official couple until recent years. Heck, even in Kermit's appearance on Jimmy Kimmel or Craig Ferguson or whatever show he was on to promote "Very Merry Muppet Christmas Movie," he said his relationship with Piggy was over, so again it's sort of been on and off. I think the two differences here are (1) this never was a major headline until now and (2) Miss Piggy has always stated that she and Kermit were a couple and Kermit was the one who denied that. Now according to an article I read, I believe it was tvguide.com or something like that, Piggy's stating herself that the relationship is over. So aside from those differences, I guess this isn't really anything new. For those talking down to people who find this depressing. People are allowed to not like this piece of news and complain about it, stop lecturing them for feeling that way! Which I don't get, yet sort of do at the same time. Still, the fact that they refused to mention any behind the scenes anything in the TV Guide thing but didn't feel the need to respect the same of ALF was a little...off. And especially all the horror stories I heard about Paul Fusco trying to do the same thing, making him a virtual celebrity, it's a little...off. And to the poster saying "only we have the right to complain about this." ...Really? So we don't have the right to complain about your complaints. Gotcha. Top Trending topic this week on Twitter. Headlines! Cover stories! TIME, USA Today, People, US Weekly, Entertainment Weekly, Variety, Glamour, THR TV Guide and (ugh) even FauxNews. It's genius. And only ONE reporter from ONE small outlet refused to play along. Watch some of the S2 S3 episodes. He wasn't just a jerk...he was cruel and said terrible hurtful things sometimes about her weight. Are people seriously complaining that the mainstream media is treating this story as real?? THAT'S THE WHOLE POINT OF THE MUPPETS. THAT'S HOW THE MEDIA IS SUPPOSED TO TREAT THESE STORIES! It's AWESOME that they all played along. What surprises me is how many "so called" fans here REFUSE to. COME ON. Duke Remington and Katzi428 like this.